ESL announced the Counter-Strike: Global Offensive broadcast talent that will be featured at the IEM Katowice Major from Feb. 13 until March 3. 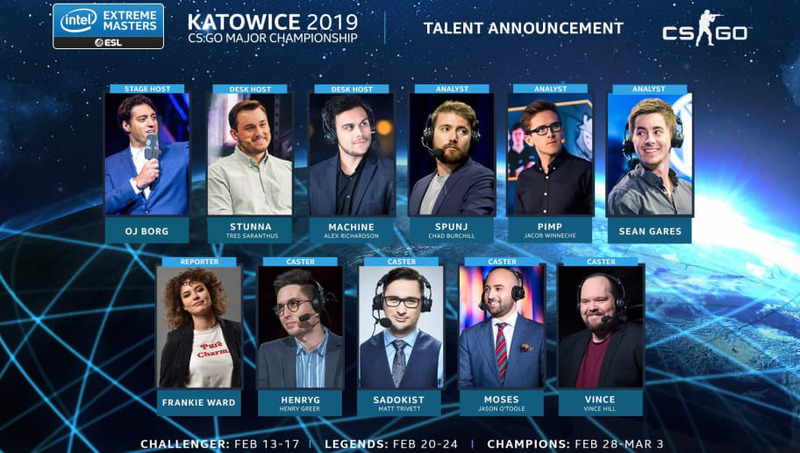 ​​The IEM Katowice ​CS:GO Major broadcast talent was officially announced Friday by organizers. The lineup revealed O.J. Borg will be at the event as the stage host, with Tres "Stunna" Saranthus and Alex "Machine" Richardson as the desk hosts. Chad "SpunJ" Burchill, Jacob "Pimp" Winneche, and Sean Gares are the analysts for the Major. The reporter for the event will be Frankie Ward, and Henry "HenryG" Greer, Matt "Sadokist" Trivett, Jason "Moses" O'Toole, and Vince Hill complete the lineup as the casters. The IEM Katowice Major will ​feature 24 teams. Valve recently announced tournament stickers for the event ​are available in-game for fans.